To open a forum for communication between readers and me. First Printing Errata . . .. . . . .
Download corrections here . . . . . Except for the Classroom Uses section, from here you need only choose the calculator you use in the table below and visit one of the sections of that site to obtain appropriate materials. The teaching suggestions and exercises are common to all calculators; they are included in separate links following the chart. 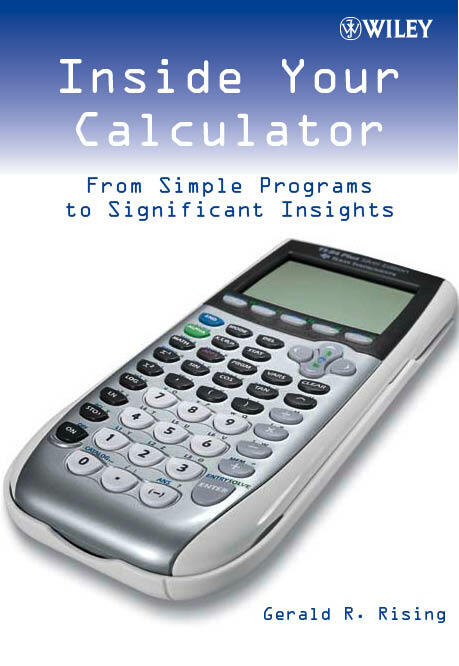 The Programs section allows you to download individual programs that appear in Inside Your Calculator directly to your calculator if you have the appropriate software and connectives. For calculators other than the TI-84 and TI-83 it also provides text versions of those programs appropriately revised for these calculators. Look in Applications for additional programs. These correspond to additional appendices. Stephen Pfetsch, Doctoral Student, Rice University, Houston, Texas: In my first semester of college, I enrolled in the undergraduate honors seminar taught by Professor Rising as he wrote Inside Your Calculator. Now, from the perspective of a student who has just completed a dual degree program in math and engineering, this seminar remains my favorite math class of my collegiate career. The seminar covered a potpourri of interesting topics that are not sufficiently explored in other courses, with a significant thread being the mathematics behind the functioning of modern calculators. Professor Rising touched on number systems and algorithms for converting between them, looked into mathematical games whose solutions have foundations in binary, and illustrated some ways in which a calculator's algorithms may be optimized. Investigation of the contrast between the calculator's shortcomings and human ingenuity gave birth to a set of programs that augmented the calculator's abilities. I still keep these programs on my calculator and I am looking forward to reading Professor Rising's finished text. Mark Marino, Mathematics and Computer Science Faculty, Erie Community College, Buffalo, NY: I co-taught a University at Buffalo undergraduate honors seminar with Professor Rising, the author of this book, using preliminary versions of Inside Your Calculator chapters. We found that the materials served these 29 students very well and, without exception, their course ratings were excellent. Of course, they learned a great deal about their calculators -- most class members had TI-83s or TI-92s, but there was one TI-89 and one Casio 7400GPlus user in the class -- but most of their course evaluation comments spoke of the mathematics they learned as well. Three are typical: "I learned more math in this course than I did in all of high school and my first year of college," "I'm now using my calculator and the math I got in this course not only in my UB math classes but in physics too," and "I have had this calculator for four years and only now am I working with it to anywhere near its full power." I look forward to using the published book as soon as it is available. William Parks, retired from Mesa Community College, Mesa, Arizona: I have been involved with mathematics and computer education in community colleges for my entire career and I continue to review books for teaching beginning students about calculators and computer programming. When Professor Rising shared preliminary versions of this text with me, I urged him to make it available for wider use. I am delighted that Wiley is publishing his book as I believe that it is a unique and quite remarkable approach to teaching calculator use, programming essentials and pre-calculus mathematics.